After several days of poker both online and live at the magnificent Wembley Stadium, Jakub Michalak has emerged as the winner of the International Stadiums Poker Tour inaugural event, officially banking himself a cool €1million. Michalak is the number one ranked online player in Poland and in the top fifty in the world. He would be the first to admit he got lucky in two crucial pots against the aggressive Nottingham-based player Pete Linton but backed this up with intelligent and aggressive short-handed play to seal his victory. Gwendoline Janot was the first player to be eliminated, she was crippled losing with pocket sevens to Xavier El Fassy's kings and was knocked out in the very next hand by Michalak. Frenchman Alban Juen was next out, he'd started the day second in chips but after getting in a raising war against Linton, he was eliminated after losing the flip. After the earlier battles, it was inevitable that Michalak and Linton would get into another big pot and this one would be the biggest of the tournament, as over half the chips in play went in the middle as Linton's ace-queen battled Michalak's king-jack. The players took a dinner break but after only 30 minutes, Nick Hicks, who'd been mostly card dead for the final table and playing snugly was caught when Michalak flopped trips against Hicks' top pair. Jakub Michalak bet 400,000 from the button with . Xavier El Fassey held and raised to 950,000. Michalek went all in and was instantly called. Michalak turned his cards over first, El Fassey just savouring the moment before showing him his kings. Overkill on the Aces and Michalak had all the chips. El Fassey finished second for €201,000. Jakub Michalak opened to 400,000 with and Xavier El Fassy defended by three-betting to 900,000. Michalak then four-bet to 1,420,000 and El Fassy called, leaving himself 3,000,000 chips behind. El fassy then checked the flop, Michalak continued with a 575,000 bet but quickly folded when El Fassy moved all in. 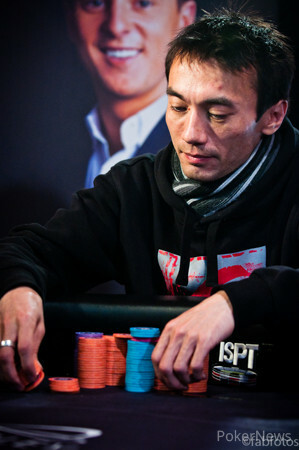 Here's how things measure up as the ISPT Wembley Main Event reaches heads-up. Jakub Michalak min-raised on the button with to 400,000 and Nick Hicks called from the big blind with . Hicks checked and called Michalak’s bet of 350,000. The turn was . Michalak made a big bet of 1,100,000. A real tough spot for Hicks, but he decided to call. The river was . Hicks checked and when Michalak bet enough to put Hicks all in he called and saw he was beaten. Thanks to him eliminating Pete Linton, Jakub Michalak has a massive chip lead in this tournament and is in Pole position (see what we did there?) for the €1,000,000 first place prize! Xavier El Fassy had limped preflop with and Nick Hicks checked his option with . Both players checked the flop before El Fassy took a 300,00 stab on the turn. Hicks called and the came on the river, now El Fassy checked and Hicks bet 705,000 - quickly getting called. While looking for information about our final three players we came across this gem by Amy Trodd (who finished 28th here). Xavier did a really cool thing on Day 3... he was next to the disabled gentleman who was in a wheelchair, after the break the disabled guy turned up to find all his chips had disappeared... 30k ish apparently... Xavier counted his chips and noticed he had 30k more than he thought. Turned out when the dealers were racing off the 500 chips, they had mistakenly given all the chips to Xavier as there was no chair for the other player. Bet alot of players wouldn't even bother counting their chips, never mind admitting they think they had more than they thought... Karma. 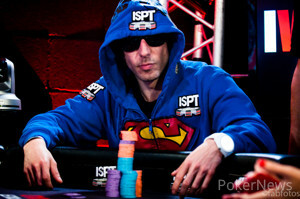 Can the French barman go all the way here in the ISPT Main Event? Maybe the Poker Gods will repay his honesty with €1,000,000?